Valentine gifts are wide ranging, from a card to a car. We decided to take the high road and look at a couple of cars that hit the “sweet” spot of gift giving. The Lexus IS 250 and 350 compact sedans are now in their third iteration, and like most other re-do’s, have refinements that bring buyers back to the showroom for a look-see. At first glance, a bolder spindle grille and sculpted rocker panels will grab your attention. True IS fans will also notice a 3-inch stretch of the wheel base too, giving rear seat passengers some additional and much-needed leg room. Driving dynamics have also been massaged with a new multilink rear suspension and the addition of an 8-speed transmission in the 350 model. 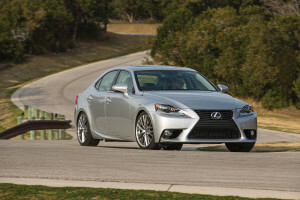 The IS 250 is equipped with a small, 2.5-liter V-6 that produces 204-horsepower and delivers 21 MPG-city and 30-highway while the 3.5-liter 350 gets 100 more horses with almost the same fuel economy. The interior’s comfort level scores high marks with cushy, supportive seats, and a great Mark Levinson sound system. New this year is the Enform remote app that gives you control of certain car functions from your smart phone. Pricing for the IS 250 starts at $36,550 while the 350 goes for $40,065. Mini Cooper is the car that brings a smile to just about everyone’s face and we’re no exception. Last year’s redesign brings with it two new engines, a slightly larger overall size, and enhancements to some interior bits. Mini has scaled back on the number of models it produces. 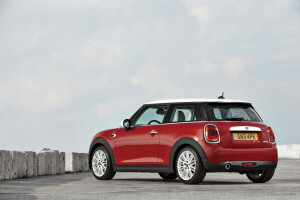 You can now shop the two and four-door base models, the larger Clubman version and its John Cooper Works hot rod model. The two-door’s base 3-cylinder engine produces 134-horespower and utilizes either a 6-speed automatic or manual transmission. For ever more fun, give your honey a special thrill by bumping up to the 2.0-liter 4-cylinder engine that whirs out 189-horses. Screams of delight will be heard blocks away. That big round info center in the middle of the dash now contains the radio face and optional driver interface, when equipped with the Wired package. The speedometer moves to the traditional spot behind the steering wheel. The Mini Cooper’s race car-like driving dynamics might not be for everyone since its firm ride quality can take a little getting used to. The Mini Cooper starts at a meek $20,700.